After the breakfast debacle (The Intricacies and Pitfalls of Indian Cooking and Mr P! , http://avatarofmrbean.com/2012/03/26/the-intricacies-and-pitfalls-of-indian-cooking-and-mr-p/), do you think that G would have stayed for lunch if invited? Guess what? He did! He understood that Mr P was feeling a bit downhearted and so he agreed to give him another chance to prove his culinary skills. There are some people who would take any amount of beating and would still turn the other cheek because of a soft heart. G belongs to this rare, endangered species of ‘softies’ that is on a path of accelerated extinction. G is also a vegetarian. 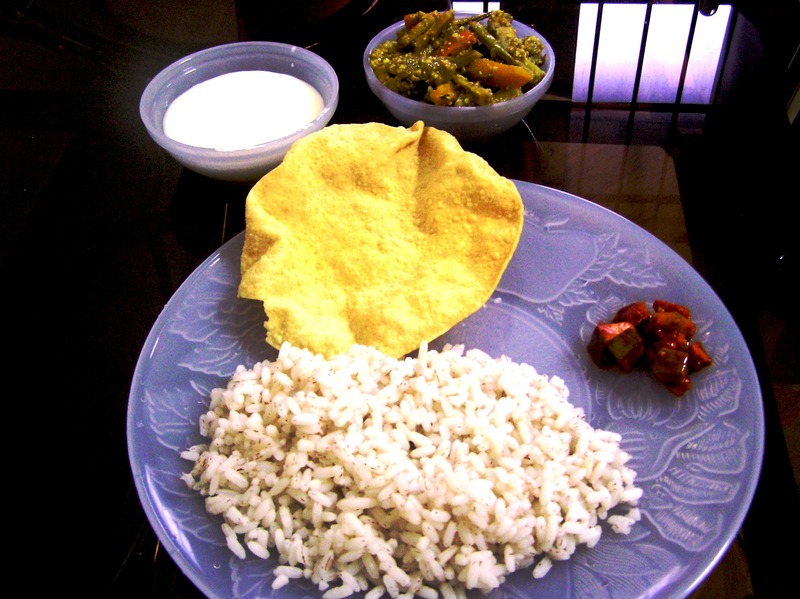 Mr P decided to cook rice and make daal, pappad and Aviyal to go with it. 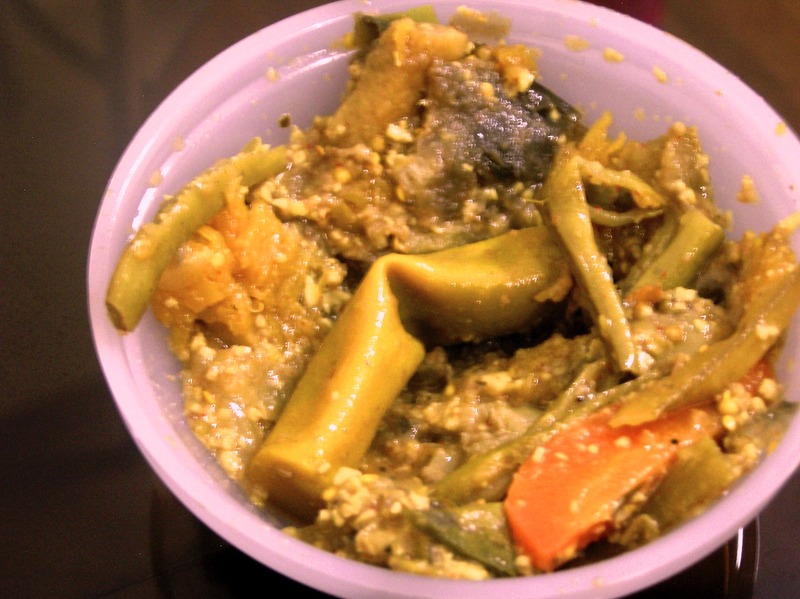 Aviyal is made from finger sized pieces of all the vegetables such as cucumber, snake gourd, eggplant, green chillies, long beans, carrots, yams, green bananas and drum sticks (of course not drumsticks that are chicken legs, but long fruits of Moringa plants). 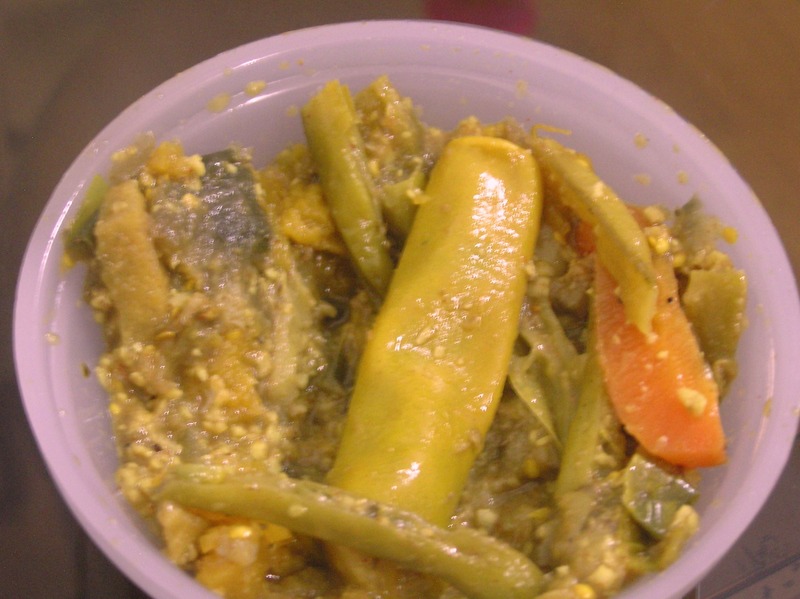 These vegetable pieces are washed well and cooked in a little volume of water with tamarind and salt to taste. Turmeric and red chilli powder or pastes are also added. Ground coconut and cumin and curry leaves are added towards the end. For Mr P, the most difficult part in this whole recipe was cutting the vegetables to size. 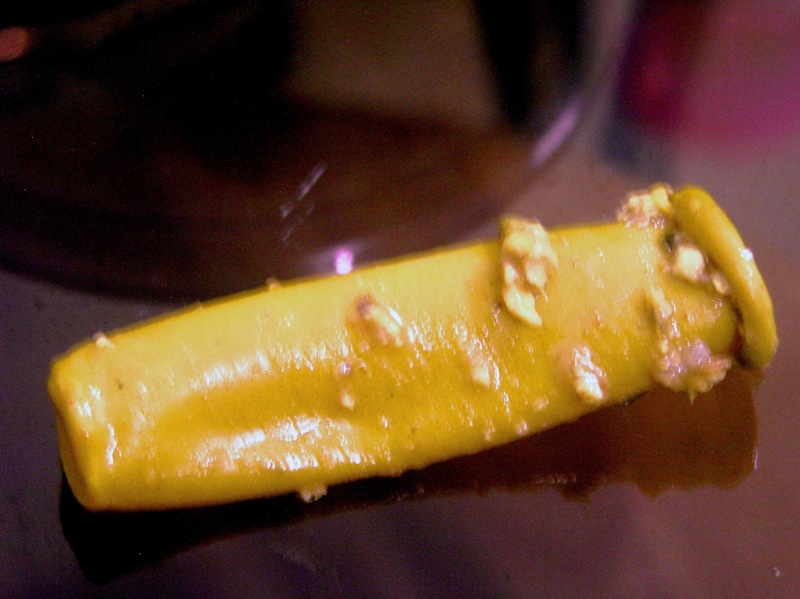 “The vegetables are to be finger sized. “They cannot be cubes or any other shapes because that is one thing that distinguishes Aviyal from other dishes,” Mr P had learned. While cutting them into finger shaped pieces, he was worried he would cut his fingers as well. However, since he started wearing finger gloves on all his fingers while slicing vegetables, he had become more confident. So while G left to do a little shopping, Mr P stayed home and cooked the meal. Something happened to the daal which is matter for my next post. “Let’s forget the daal. Yoghurt would serve equally well and I’ll also serve a little bit of mango pickle”, decided Mr P. When G came back and they sat down for lunch, he had the meal neatly served on the dining table minus the daal. Two spoons of food later, G suddenly choked and turned red. He was staring at his bowl of Aviyal. “ You do know that I am strictly vegetarian, don’t you Mr P?” he asked. “Sure, I do,” said Mr P.
“And this Aviyal….. Are you sure it is vegetarian?” asked G slowly moving the vegetables around in the bowl. Mr P looked at G’s bowl of Aviyal. There, partly covered by the gravy and vegetables was something that looked like a finger! Mr P surreptitiously checked whether all his fingers were intact. Assured, that the strange THING in the Aviyal was certainly not one of HIS body parts, Mr P investigated further. It was bent at an angle that reminded Mr P of the celebrity actress’s leg at the last Oscars that had jutted out through the dress slit, sending the whole world a-Twittering and starting an account-Angelina Jolie’s Leg @AngiesRightLeg. Mustering all his courage Mr P pulled the THING out. It lay in full surrender on top of the dining table. Lo and behold! It was the one finger glove that was missing when he had put them away after washing the vegetables! The Intricacies and Pitfalls of Indian Cooking and Mr P! Mr P was in a flurry. He had a guest G, from overseas, coming for breakfast and he wanted to make an impression. Initially he thought he would make Dosa. Dosas in their simple form are nice, thin, pancakes made from ground rice and black gram made into a paste and fermented overnight. 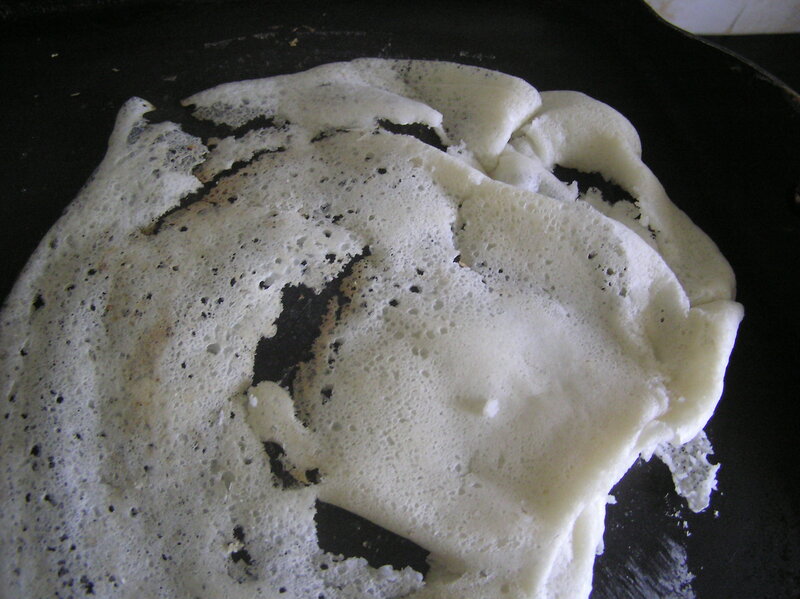 Mr P’s cook could make somewhat well-shaped and tasty Dosas but unfortunately it was her day off. Mr P could never cook well-shaped, circular Dosas. He would have been happy even if they were not perfectly round but turned out at least in the shape of Sri Lanka or even Australia. Sadly however, Mr P’s Dosas were often the shape of India, America and some other countries of the world including New Zealand, Singapore and Japan! So when Mr P thought about it further he was not that sure about serving Dosa to his guest. Moreover, the last time when Mr P had tried to cook a Dosa all by himself, it had developed an attitude and a mind of its own and had refused to come off the pan. Finally he had to scrape out bits of sticky mess from the pan which in no way looked anywhere related to a Dosa. In fact it had resembled the humble Upma. With this thought, Mr P’s mind that had been flitting like a butterfly in the garden of Indian breakfast gastronomy, suddenly settled on Upma. The Upma had become world famous when it had helped Floyd Cardoz in New York, to walk home with the award for Top Chef Master Season 3, of 2011. Mr P in all his humbleness was confident of beating any Top Chef Master in Upma preparation. After all wasn’t it a South Indian preparation and who else could claim to cook it better than Mr P? He also decided to make tea the Indian way to serve with the Upma. Before continuing with this anecdote, let me impart this knowledge for those who are not aware of the intricacies of Indian cooking. Upma is prepared by adding roasted semolina into the correct quantity of water while it is boiling. The name Upma is derived from two words. The first word, Up for Uppu, means salt or salty. The second word is Ma and you have definitely got it wrong if you think Upma means Salty Mother!!! The term Ma stands for Mavu which means dough. 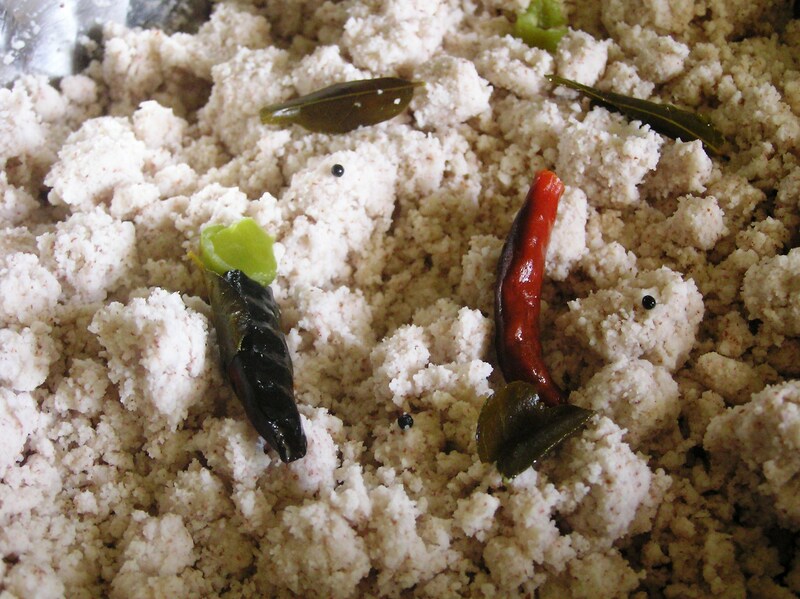 So together Upma means salty dough and it is easy to guess that salt is a major ingredient. The required amount of salt is to be added into the boiling water before the semolina. 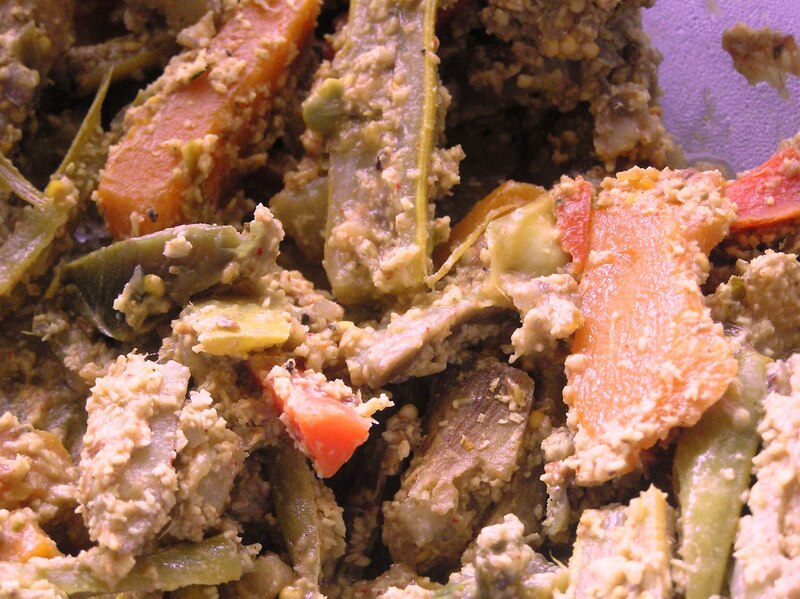 Ginger, green chillies, curry leaves and sometimes onions are added to give flavor. In Kerala, plenty of grated coconut is also added. The traditional Indian way of preparing tea or “chai” is by boiling water on the stove and adding tea leaves/powder directly into that water. Sugar is also added into that boiling water and the liquid is then strained and mixed with boiled milk. 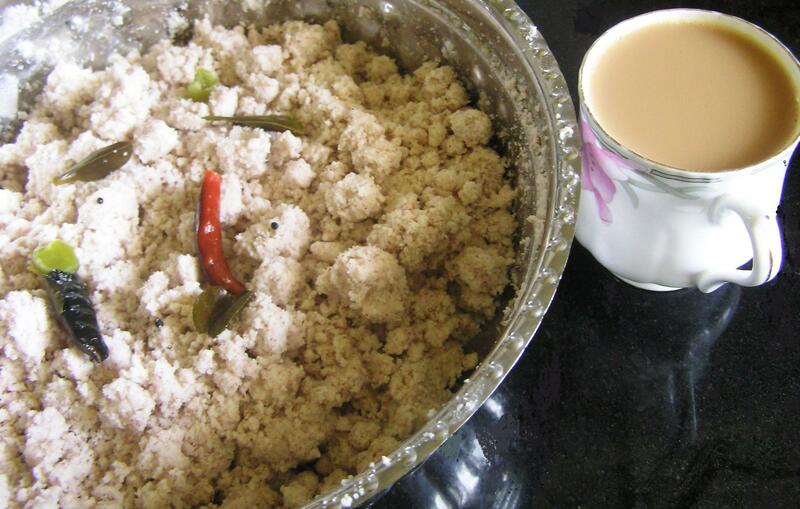 “Easy meal to prepare” thought Mr P and roasted a cup of semolina for the Upma first. He then put a pot of water for tea on one burner and a pot of water on the other burner for the Upma. The cooking went off incident free and the Upma appeared to be alright albeit a little bit sticky. Guest G arrived on time and Mr P served the Upma and the tea to his guest. We can imagine how lyrical Mr P would have been praising the Upma as a wholesome food and what a winner it was at the Top Chef Master competition. G put a spoonful of Upma in his mouth. Mr P waited eagerly for a comment and the guest cleared his throat. “Interesting”, he said. G was in a cover-up mode and with a face devoid of any expression, hastily took the cup of tea in his hand. Mr P tasted the Upma then. It was slightly sweet. But was there any salt in it? No, not a teeny-weeny bit! Nil! None! Nada! The “Salty dough” was totally salt free, unsavory and unpalatable! “Where did all the salt that I put in the water go?” Mr P wondered. He glanced at G furtively. 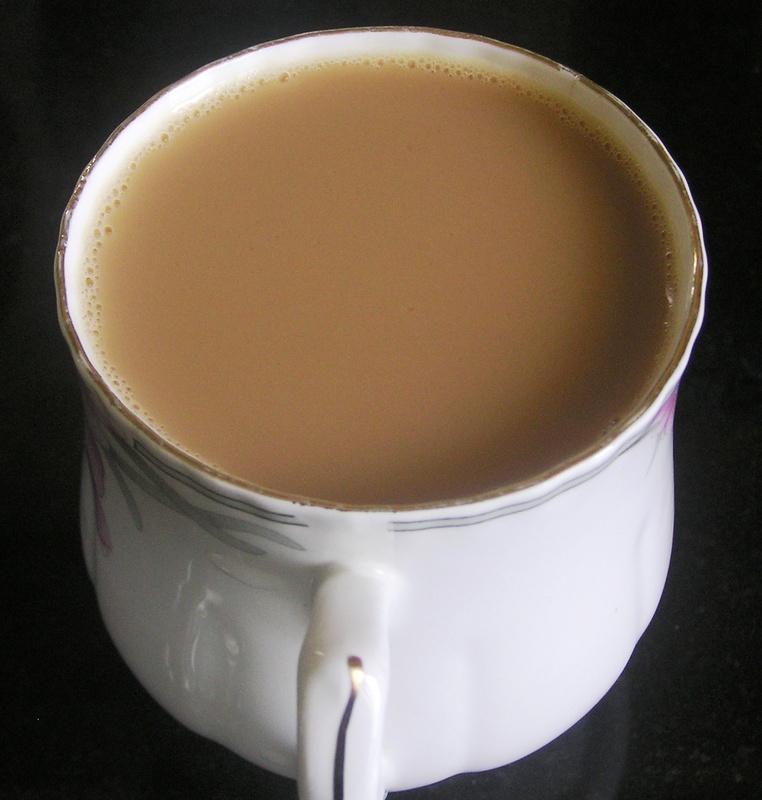 G had taken a big sip of the tea to wash down the bad taste of the Upma from his mouth…. A tortured look came over G’s face and he gagged…. in an involuntary retching reflex! Mr P Catches a Ghost! This Halloween Mr P had finished all the sweets he had bought. He did not need any kids to scare him. 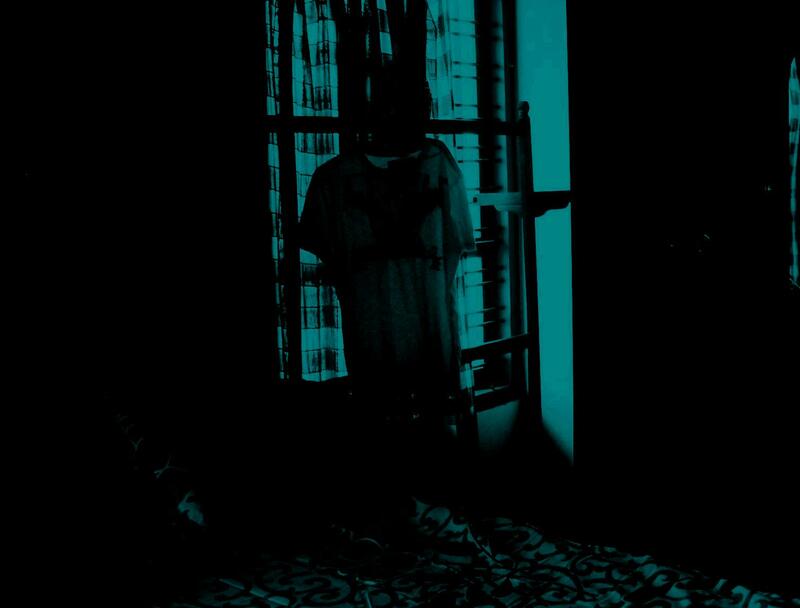 He was already scared of the ghost who was haunting his bedroom since he moved in there. Mr P could not sleep because of the ghost. Every time Mr P moved in his bed, the ghost would tap on the window and send him curling to form a shaking, shivering ball under his blanket…… Strangely the ghost hesitated in coming out of his bedroom and he heard the knocks only from the bedroom window, especially when he turned out the lights and lay down in his bed.Things got so bad that Mr P sought out all sorts of excuses for sleeping on the couch in the living room, or prolonging the time he stayed out of his bedroom. On this particular night, after having finished all the sweets watching the scary Halloween special movies, Mr P had finally gathered up some courage to go to bed and had brushed his teeth. He had spread his washed towel on the clothes stand by his bed and was wiping his hands on it when the knocking started. Mr P screamed and ran out of the room. He was shivering, crouched on the sofa in the living room when he heard another knock and screamed again before realizing that the latest knock was coming from the front door. He went and opened the door and saw his friend and neighbour who had come to investigate the screams. Through chattering teeth, a trembling Mr P told his friend Chris about the ghost and Chris agreed to check it out. They walked into the bedroom. There was no sign of the ghost anywhere and there was no knocking sound when both of them stood still in the room and waited, holding their breaths. Then Mr P suggested that the ghost could be waiting for him to get into his bed before it started knocking. Chris asked him to get into his bed to stir the ghost up and Mr P obliged. As soon as Mr P climbed into his bed, they heard a knocking sound coming from the window. Every time he moved in his bed the ghost did not seem to like it and kept knocking on the window. While Mr P shivered and slid under his blanket, Chris moved close to the window to catch the ghost in the act of knocking. And he did! It was the coat rack! 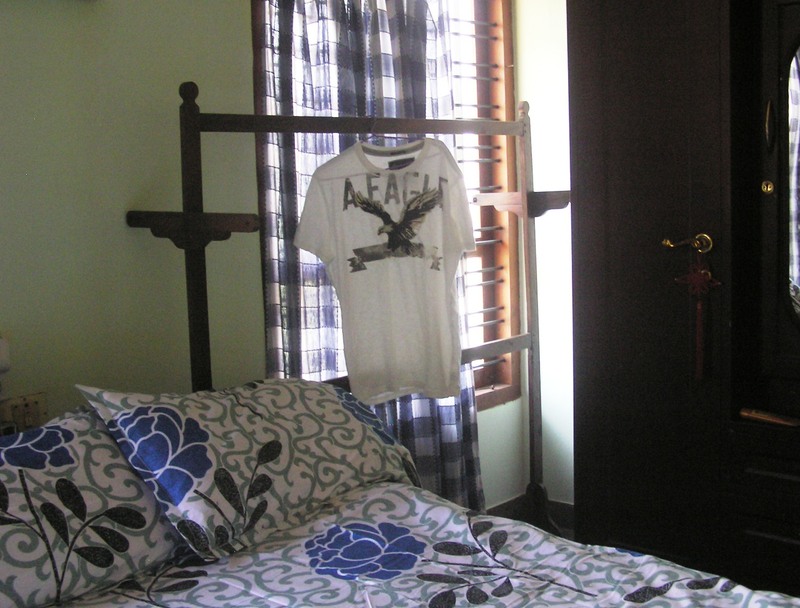 The coat rack that Mr P had inherited from his grandfather and kept next to his bed was touching the bed. 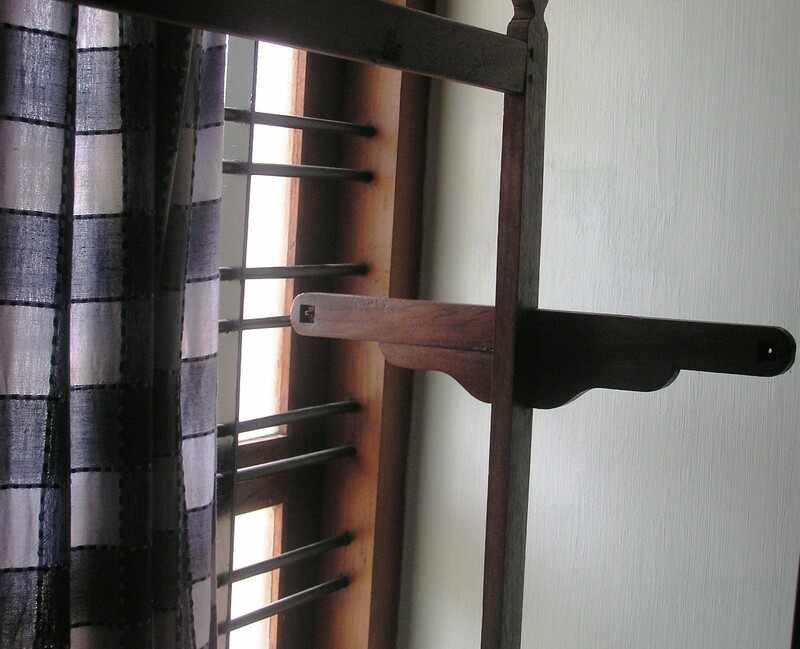 It was wobbly and it moved every time there was the slightest movement on the bed and a part of the other end of the stand knocked on the window bar! No wonder there were loud knocks at night that woke Mr P up from his dreams of playing soccer. Bear in mind, Mr P kicks around a lot with his legs when he is sleeping. Anyway, the long and short of it is that Mr P was very glad HE had knocked off the knocking ghost!